This was the motto that got me to this point when I saw the word “Congratulations” flash on the screen. I had just hit the “End Exam” button. 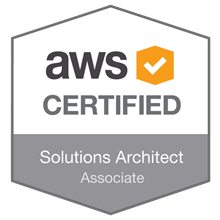 I couldn’t believe it, I had finally passed the AWS Solutions Architect Associate Exam. While I sat in the 80 degree testing room (why put ten people in one room with 10 computers, then shut the door with no AC?) staring at the screen, I couldn’t help but be thankful. I had finally passed the test that, up until that point, struck fear in my mind. The culmination of over a years worth of preparation, many up and downs, two failed attempts and continued effort finally paid off.